i don't know how else to explain this besides completely straightforwardly. 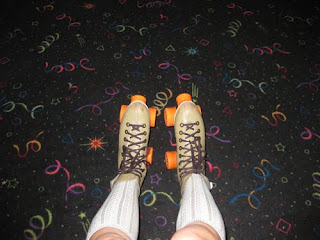 last night i went rollerskating. my friends (greg and his friend charlene and her friend tas) said it was "organ music night." i didn't know what they meant by that but apparently they meant exactly what they said. 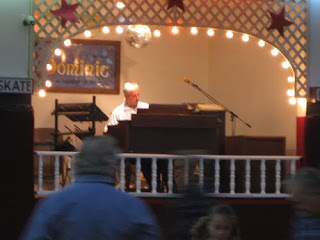 it was organ music night at the rollerskating rink. the night was full of magic. 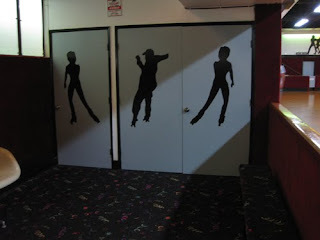 first, you may think that geriatrics have no place on a rollerskating rink because of their fragile nature, but let me tell you, those fogies got MOVES! there was one guy in particular whose backwards skate... whew! 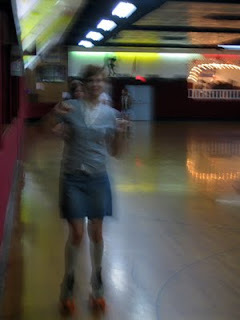 watch out, [...famous backwards rollerskater???]! anyway, it became very obvious very quickly that tuesday nights are love connection nights for this crowd. the rink is a place for elderly gentleman, like peacocks, to show the world what they've got. the two elderly women there have many tantalizing options to choose from. ok second, ISWEARTOGOD i started a rink-wide clap-along to one of the organ songs. it was like starting the wave at a dodgers game, only about 1,000 times smaller. but whatever, same sensation! one of the best skaters there appreciated it so much, i even got an "aOOOga!" as he rolled past me. i felt like a mighty duck or member of cool runnings or something. THIRD, after about an hour of on-again/off-again skating, i developed a blister on the inside of my right foot, and had to sit down and take the skates off. i was approached by a tall, skinny dude in his late 40s with a wrap around his knee (skating injury). he asked me why i wasn't skating anymore, and explained i had a blister. "Well I'm Sparky," he said, "and I can tell you how to lace your skates so you won't get any more blisters." which he did, and it was very educational. he told me to come back next tuesday at 7pm sharp and he'd help me lace them himself! that was quite an offer, i'd say. well as the evening was wrapping up and love connections had been made and the organ player got to the end of the 12 songs that can be played on an organ, greg sat down to put his shoes on too. 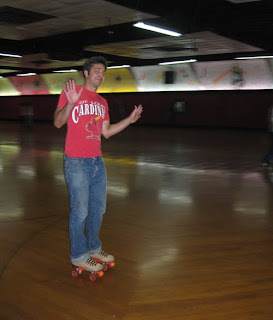 another rink employee -- the guy that kept blowing a whistle at all us newbies and telling us to "keep moving" even if that meant downward onto our asses -- swung by and said "Hey, I just wanted to say your backwards skate really improved! You stuck it out there when everyone else gave up. You keep it up and you're going to do really well." the look on greg's face is probably pretty similar to the one he'll have when his first child is born or something. go greg! haha, that looks like a pretty sweet time. where do all skating rinks* get that carpet from?